Part 1 was more about the making of the handles, here I would love to share a little bit more about the making of the heads, how I selected the materials and what motivated those shapes. I have worked closely with a Master Artisan, he was working on the shapes based on my designs, we talked very regularly by email with the help of my contact who was translating, It was great to know that it was always the same artisan and that with time he got to know me really well, and know exactly what I wanted. I have a weak spot for fan shaped brushes, you’ll see quite a few in my collection, but they do not function like normal wispy fans. At this point, the whole collection is not out yet so it’s difficult to show you the whole picture. With the fans, the idea was to change a bit the way we use our make-up products. I have a lot of products that I still love but that I don’t use on a daily basis because I can’t make them work easily, they are either too difficult to pick or too time-consuming to apply. These brushes will handle a daily use but also have an editorial functionality, they could happily fit in both categories. All the brushes had to be fitted with the best bristles for the purpose, they had to feel good on the skin. However, we all know that the softest brush is not always the one we reach for when we are in a hurry! I was aiming for the best balance between softness and efficiency -the fewer strokes required, the better; less strokes also mean less contact or irritation. Efficiency has been my top priority; most of us struggle to find the time to get ready in the morning, we may want to do a bit of all, from foundation to highlight or contour, not always because we need it on a daily basis but because we love it. I had the ambition to create brushes that could help us where I believed we struggled the most. For example, with shimmers and metallics, or smaller eyes or more mature skin and to achieve results fast! I have used blue squirrel bristles for a few eye shadow brushes, there are no squirrel face brushes. 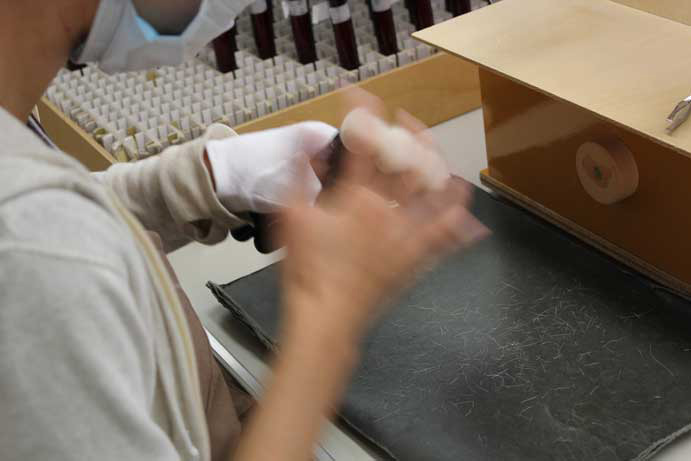 The manufacture receives all the materials from their verified trusted sources. I used mostly saikoho goat bristles, those bristles are super soft on the skin, they keep their shape really nice, they endure more frequent washing and they are appropriate for all skin types. 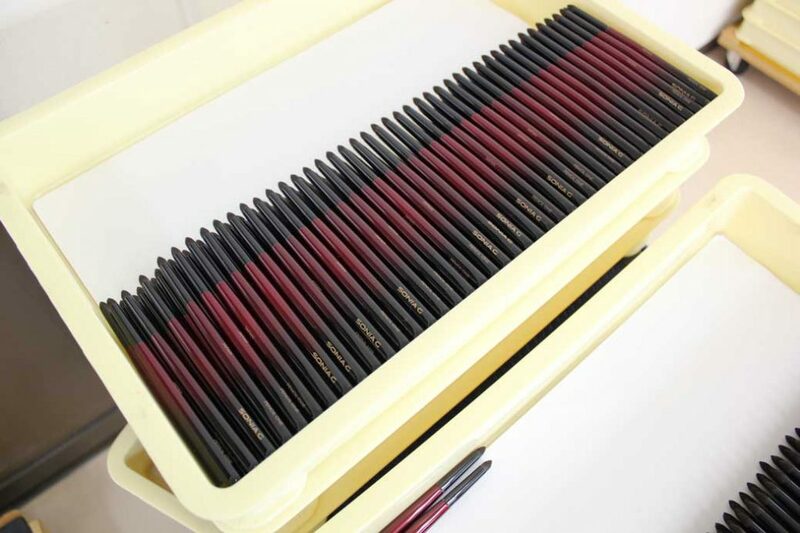 The bristles were dyed on some brushes because the dye process gives more grip to the tips and this was a necessity to achieve better results. Sometimes I used Hakutotsuho goat, either on its own or mixed with synthetic, those bristles are thicker and stronger than saikoho goat. I have also tried to create full synthetic brushes, I did a few actually, but had to put them on hold for now. 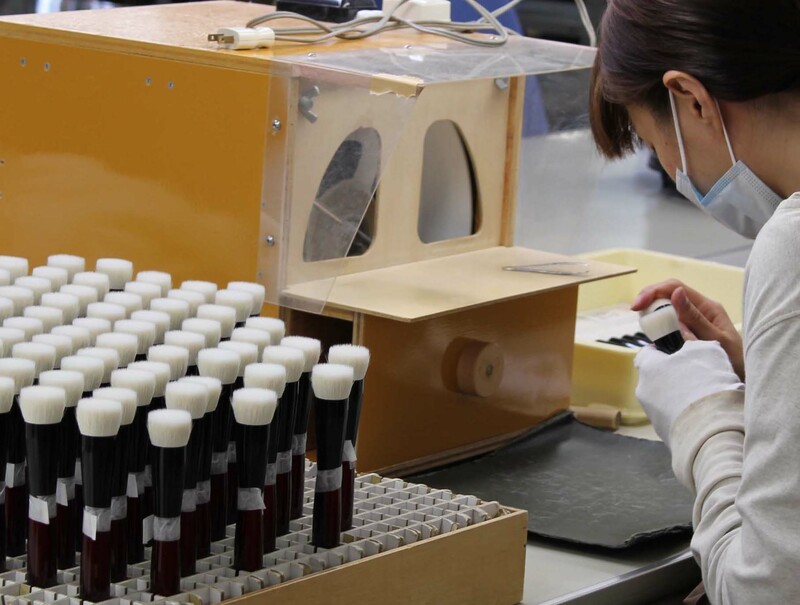 The synthetic bristles that are made in Japan today are still very expensive to produce and for the moment, I could not find in them the functionality and efficiency that I was looking for. I am not saying those bristles aren’t good, they aren’t what I am looking for today so I will come back to this option at a later stage, as soon as this becomes feasible and more affordable. I did not select the type of bristle for each brush because of how the brush looked, or based on my personal favorite material, I always selected it based on the results I was aiming for. The ferrules sometimes are curved, sometimes they aren’t, this has an impact on the functionality, sometimes it can also be to prevent the ferrule from scratching the eyes, specially when they are used so close but in most cases, using a curved ferrule -or not- does change the way a brush will work. I have been there to see the brushes in person, I checked the quality and the shapes and was really impressed, they were so nicely shaped and consistent. I have talked to almost all the people involved, it felt really strange to be there, this time it wasn’t just to visit and say hello! I was a bit of a pain at times because I would not compromise on anything, but they were extremely excited by the challenge and they went above and beyond, what I have asked for, they delivered 100%. From the start to the end, they deliver the best quality possible. They check, they re-check, they improve. The amount of time spent on each brush is higher than I thought, you can only realize this when you work with them. I am happy that I can show a few pics, and you will see more in the future, either with me or with Beautylish. For example, I know many of you are concerned with the shedding of natural brushes. 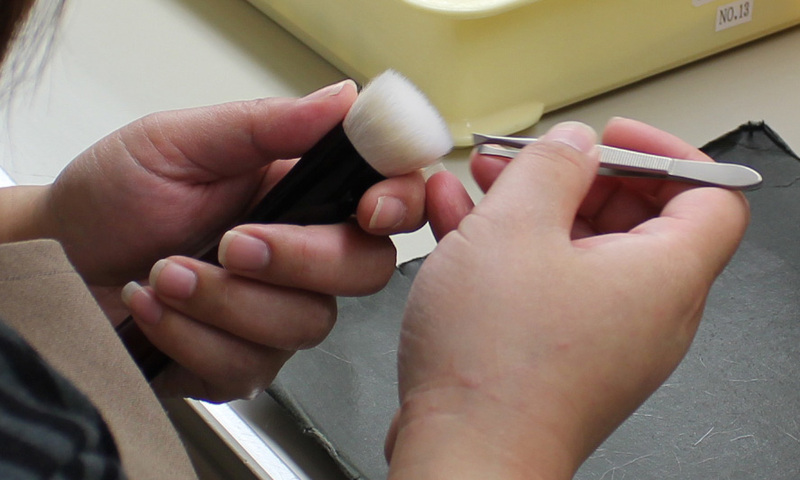 All natural brushes will shed at some point, specially at the beginning, but there is a process at the very end that ensures they will shed as little as possible. The bristles that shed are “weak” or “excess” bristles, this shedding should even be more obvious in dense brushes. 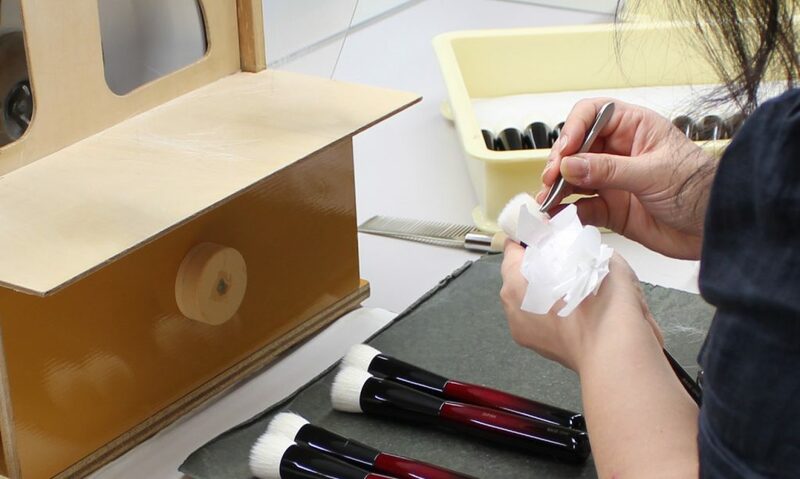 The brushes are checked one by one, the unnattached bristles are removed with 3 separate processes, eventually some bristles may come off later but that’s still normal and totally acceptable. If all goes well, there will be more brushes, eye and face, I really sincerely hope that you will enjoy them so that I can keep working on them, making these brushes with the artisans and thinking of you while doing it was the best experience, you have no idea how much this means to me. The brushes do get better with time, after some washes and some time using them, the bristles get into their final position, with an even better shape and the results should also get better. There is a learning curve with some of the brushes but I hope they are comfortable to use and that they make each application easy and special. Congrats Sonia!!! I found your blog while researching about Fude. Your blog is amazing!! The effort you put into it is incredible. The knowledge in it is mind blowing. If I’m ever interested in a brush I always check your blog first before making any decision hahaha. 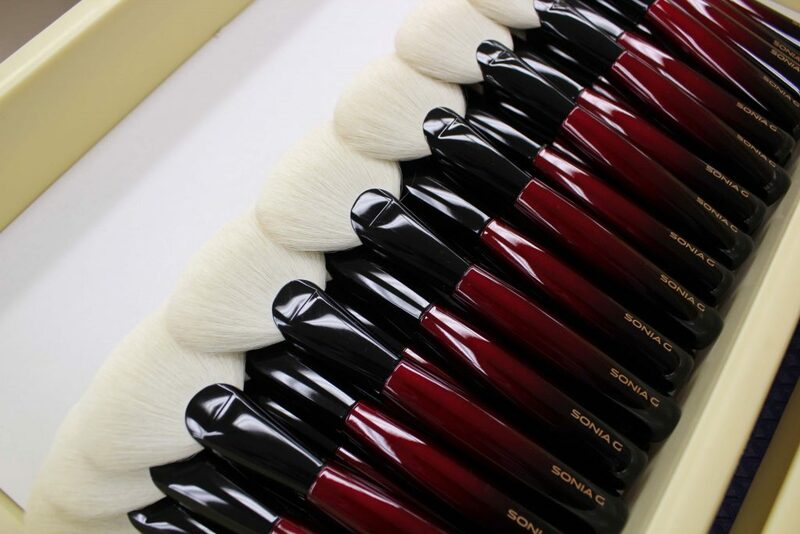 I cannot wait to get your brushes. When will it be available individually? I live in NZ and Beautylish can only ship up to $250 :(.